The Community Centre is situated in the church grounds and can be accessed from the car parks at North Avenue or The Rise. 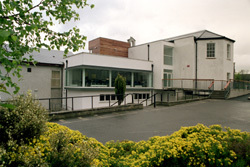 It was officially opened by President Mary McAleese on 16 May 2003. 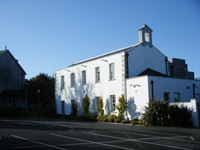 The centre is used for a variety of parish activities and provides accommodation for clubs, societies, recreational activities, a Montessori school, an after-school centre, and exercise and dance classes. In all, more than 1,000 people use the centre on a regular basis each week. 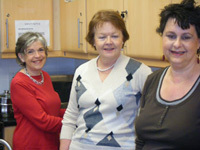 The Coffee Dock at the centre is staffed by volunteers and is open from 10.00 a.m. to 12 noon, Monday to Friday. Additional volunteers are most welcome – contact the co-ordinators Mary da Paor and Margaret O’Gorman or the centre manager. 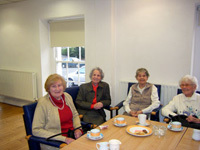 Mount Merrion Friendship Club: operates three days a week, catering for ladies on Wednesdays and Fridays, and for men on Thursdays. The main purpose is to offer senior citizens a social day out; refreshments and a full lunch are served and transport is provided. 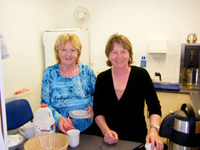 The club caters for residents of Mount Merrion and some of the surrounding areas. Manager: Mary Bartley, phone 2884411, Wednesday to Friday, 9.00 a.m. to 3.00 p.m. Outside these hours, an answering service is available. For general enquiries or to make a reservation at the Community Centre, contact the manager, Mary Flynn, who is available at the centre most mornings during the week. 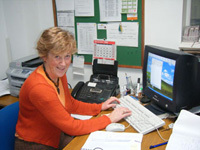 Alternatively, telephone 2884485, or leave a message and Mary will contact you. Helpers at the Coffee Dock. Meeting at the Friendship Club. as viewed from The Rise.